Paverty Bush Band is Canberra’s premier bush band. Paverty started in 1970 as Franklyn B Paverty and the Platt Valley Crooners. With a strong instrumental line up including fiddle, banjo, flute, lagerphone and feet tambourines they get toes tapping and folk up and dancing. 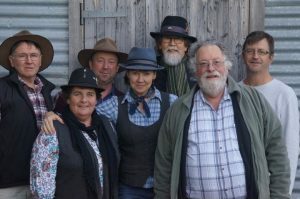 Paverty plays Australian folk music – an eclectic mix of traditional and original songs, ballads and tunes with country, blues, rock, bluegrass, skiffle and jug band influences.